We’d love your help. Let us know what’s wrong with this preview of Snow Globe by Laura V. Hilton. A Compassionate Young Woman Esther Beachy enjoys working for an elderly woman who is wheelchair bound. Her client, Anna Petersheim, is pleasant and tells captivating stories. Plus, her home is quiet and far more peaceful than Esther's, with so many siblings. She only dreads the day when Anna's grandson, Viktor, will return from the river to take over the farm. She and Vikt A Compassionate Young Woman Esther Beachy enjoys working for an elderly woman who is wheelchair bound. Her client, Anna Petersheim, is pleasant and tells captivating stories. Plus, her home is quiet and far more peaceful than Esther's, with so many siblings. She only dreads the day when Anna's grandson, Viktor, will return from the river to take over the farm. She and Viktor were classmates years ago, and he'd been an obnoxious flirt who paid attention to every girl but her. 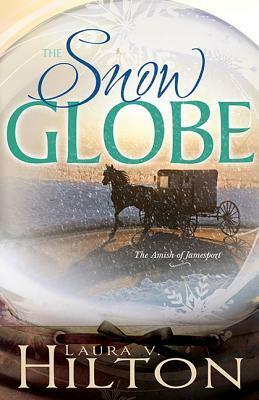 THE SNOW GLOBE by Laura V. Hilton is the first book in The Amish of Jamesport series. This author and this book is one that I highly recommend! Although, I have to admit I was intrigued about the idea of stories featured in Jamesport, MO having visited there several times, it didn’t take long before the author had captured my attentions completely as she so expertly wove the story of Esther Beachy and Viktor Petersheim. Their love story is full of twists and turns that you wonder if it’s even pos THE SNOW GLOBE by Laura V. Hilton is the first book in The Amish of Jamesport series. This author and this book is one that I highly recommend! Their love story is full of twists and turns that you wonder if it’s even possible for them to have a happily ever after. Viktor has an immediate dislike and attraction all at the same time for Esther. Esther is drawn to Viktor’s good looks, but fearful of his bad boy ways. Besides she is already spoken for since there had been an agreement between their parents since Esther and Henry were children to join the two families with their marriage. Along the way, Esther and Viktor learn how the past of each affects the here and now, but can they both change together for a better prospect of the future? There are so many wonderful characters in this book showing that even in the Amish there are good and bad, that the good outnumbers the bad and that the good usually wins out. You can help but fall in love with Anna and Reuben, Viktor’s grandparents who Esther had been hired to be their full time caregivers. Their story in itself would be an amazing story to read. The love and devotion between them is something to strive for. Lily is a character and so uncharacteristic of anything you think of when you think Amish – so full of herself and selfish – but you can’t help but feel sorry for her in the end. Rachel and Greta, two of Esther’s cousins are so completely different, show us that it’s good to speak up to help right a wrong. Bishop Joe who had an open mind and willing to listen to all sides to get to the bottom of things. Then there is Henry who took it upon himself to arrange for his marriage to Esther with the church without even asking her and already considers her his property. He is a man full of anger and hatefulness determined to do so even if it means defaming her character to do so. And last but surely not least is Esther - who has always been a good girl, worked hard and trying to please and obey – and Viktor – the labeled bad boy who has been trying to work through his own demons after feeling responsible for the death of most of his family wondering enough about God to have jumped to the English way of life. You take the mixture of characters and place them all in one extremely well written story and you have a book that have you feeling all your emotions – happy, sad, anger, fear, anticipation, panic, humor and love – turning the pages to see if or how things will work out. When you finish the book, you will start to anticipate with great longing reading the second book in this series. I know I am! OK... Before you go running off to Amazon, let me warn you that this is a review of a book which is only available for pre-order... right now. However, I highly recommend that you go pre-order it as soon as you possibly can (like right after you read this awesome review)! It is a WONDERFUL book! Laura V. Hilton shows that it doesn't matter whether you're Amish or English - love and attraction can take you by surprise and turn your whole world upside down! The Snow Globe is book 1 of Laura V. Hilt OK... Before you go running off to Amazon, let me warn you that this is a review of a book which is only available for pre-order... right now. The Snow Globe is book 1 of Laura V. Hilton's new series: The Amish of Jamesport and I'm already looking forward to the next one! This is not just a story that only readers of Amish fiction will enjoy. The clever wit and family dynamics will appeal to anyone who enjoys a good, clean romance. Sparks fly from the very start of this intriguing romantic adventure! Esther Beachy wants nothing to do with Viktor Petersheim and Viktor could not be more annoyed with his grandmother's choice of a caretaker. He has returned home to discover a woman in his house - a woman he does not want to be attracted to... but God has other plans. And so do Reuben and Anna Petersheim. One thing is for sure, we are in for a wonderfully unpredictable experience and I am certain you will be looking forward to the next book as much as I am! She remembers him as the most annoying bu in school. A flirt. And she would not think about him more than she had to......Not at all. He remembers her as a thin, gangly girl he'd gone to school with. A few years younger than him. But...., she definitely wasn't a beanpole anymore. Had she always been this pretty? When I picked up this book, it was late in the evening, so I told myself, "One chapter and that's it for today." Well, that didn't quite work out as planned. Once I got started, I couldn She remembers him as the most annoying bu in school. A flirt. And she would not think about him more than she had to......Not at all. When I picked up this book, it was late in the evening, so I told myself, "One chapter and that's it for today." Well, that didn't quite work out as planned. Once I got started, I couldn't put it down and one chapter turned into the entire book which I finished in the wee hours of the morning. Well worth it, I might add. What was it about this book that captured my attention? It is a story of what self placed guilt can do to a person. It is a story of the harm caused by gossip and envy. It is a story of having your whole life planned out for you and not having a say in the matter. It is a story of sadness, joy, love, forgiveness, salvation, and new beginnings. It is a story of what happens when one's world gets shaken up, like a snow globe, and everything just feels topsy turvy and out of control. But eventually, everything settles and falls into place. Laura Hilton weaves all of these elements into the story. Nothing is overdone. The combination is just right. And she definitely knows how to add tender, sweet, romantic, toe curling moments into the story. She is truly a master at it. It is indeed a beautiful story. The Snow Globe is an awesome book. Laura V. Hilton is one of the best Amish authors. When you buy a snow globe, you automatically shake it and in this book, the main characters have their lives shaken. This book shows so many examples of life you may go through from the negative to the positive. The details made The Snow Globe so real to me that I felt the same emotions as the characters. I loved how Laura V. Hilton smoothly introduced other characters into the book. The Snow Globe is Book One i The Snow Globe is an awesome book. Laura V. Hilton is one of the best Amish authors. When you buy a snow globe, you automatically shake it and in this book, the main characters have their lives shaken. This book shows so many examples of life you may go through from the negative to the positive. The details made The Snow Globe so real to me that I felt the same emotions as the characters. I loved how Laura V. Hilton smoothly introduced other characters into the book. The Snow Globe is Book One in The Amish of Jamesport series. I highly recommend this book and it will be released on November 3rd. My suggestion is to preorder this book now. I am excited and looking forward with anticipation for Book Two in this series. I received an advanced copy of this book and it is a wonderful read. You will fall in love with Esther and Viktor. What a story these two have to tell about their lives. I highly recommend this book. Pre-order it so you can get it as soon as it comes out. You will not be disappointed. Absolutely a story unlike any other. Laura Hilton has done a wonderful job on this book. Laura V. Hilton Has Done It Again! Don’t Miss This Book! Imagine not having a choice to make your own decisions in life. You are told that you have to be completely submissive. In other words, you have no say so what so ever even in the person you are to marry because this has been decided for you since you were very young. Continue imagining for a minute; suppose lies have been told about you and everyone but a few people completely believe those lies. What hope do you have that the real truth w Laura V. Hilton Has Done It Again! Don’t Miss This Book! Imagine not having a choice to make your own decisions in life. You are told that you have to be completely submissive. In other words, you have no say so what so ever even in the person you are to marry because this has been decided for you since you were very young. Continue imagining for a minute; suppose lies have been told about you and everyone but a few people completely believe those lies. What hope do you have that the real truth will come out? This appears to be Esther Beachy’s lot in life. What becomes of a young man who leaves the Amish community because living in that community brings immense pain and guilt to him? He knows that he can never become Amish again. After all, he did something so bad that God would never forgive him and he will never forgive himself. Viktor Petersheim is that young man. When I picked up this book and read through the first page I knew it would be a book I would have a hard time putting down. There are several scenes in this book that made my blood boil. When you have a mean spirit you are capable of anything. I loved the romance in this book. I really enjoyed reading about those tender forbidden moments. Author Laura V. Hilton has a way with Amish fiction stories that will capture your heart and mind for the duration of a book. I am in awe how her books keep getting better and better. I was so engrossed in this book that I couldn’t pull myself away from it. When I had to put it down I couldn’t wait to pick it up again. If you love Amish fiction you will not want to miss “The Snow Globe.” I loved it and I can’t wait to read more from this author. I wish to thank the publisher and author for allowing me to read and review this outstanding book. The opinions expressed are mine alone. Esther is pledged to a family-arranged, loveless future, and her destiny appears troubling. Caregiver to an elderly Amish couple, Esther discovers what truly makes a relationship happy and strong. Reuben and Anna Petersheim share a love-filled marriage that Esther dreams about and desires for her own life. The return of Viktor, the Petersheim's errant grandson could be her undoing. Laura V. Hilton creates real-life drama and passion in her characters that strongly connect the reader to her stori Esther is pledged to a family-arranged, loveless future, and her destiny appears troubling. Caregiver to an elderly Amish couple, Esther discovers what truly makes a relationship happy and strong. Reuben and Anna Petersheim share a love-filled marriage that Esther dreams about and desires for her own life. The return of Viktor, the Petersheim's errant grandson could be her undoing. Laura V. Hilton creates real-life drama and passion in her characters that strongly connect the reader to her stories. Her research and knowledge of the Amish lifestyle is a strong point in developing creative yet believable situations that coincide with Amish customs and beliefs. In "The Snow Globe" Esther's relationship with her intended is not a love story, only an obligation. When Viktor is introduced into the story a strong attraction forms between the two, and love becomes the theme. As the main characters face opposition and insurmountable obstacles that stand in the way of a shared life, their love for one another only escalates. Prayer and strong faith are powerful attributes that run throughout this story. The first book in The Amish of Jamesport series starts this series off with an explosive relationship that will take your breath away. I became so attached to the characters in this book that I ached for them when troubles came their way. Pick up a copy of this book and enjoy a roller coaster ride of "verboten" love! The characters are likable and easy to relate to; they are loving and considerate… and they are interesting. Too many times I’ve read novels with characters I have nothing in common with, and they’re not appealing in the least; Laura V. Hilton excels at creating characters that appeal to her readers – readers of Amish fiction, especially Amish romance. Of course, you can’t have a hero without a villain… but even so, he makes the book great; I just love reading about him getting what’s coming to him! It’s too easy to picture quiet Esther taking care of Anna and Reuben, while waiting for Henry to propose. Then there’s Viktor… tall, handsome, self-assured, needing the love of a good woman, yet feeling as if he doesn’t deserve happiness. And don’t forget Henry, who seems to have feelings for another girl, but is determined to marry Esther. Can Esther break through Viktor’s defenses? Or will she marry Henry? I love the easy, comfortable relationship between Esther, Anna and Reuben. When Viktor comes home to help out, he’s not looking for a relationship, but the moment he meets Esther, he finds her unforgettable… and irresistible! This makes for a great romance novel. This was the first book I have read by Laura Hilton and what a wonderful book it was! Her characters were real, believable, sent sparks of romance flying as well as emotional turmoil and decisions that had to be made. Esther Beachy and Viktor Petersheim are both running away from their personal situations. Esther is escaping an overcrowded house, a father who expects her to turn over all her earnings to her family and a marriage that is arranged to Henry Beiler who turns out to be emotionally an This was the first book I have read by Laura Hilton and what a wonderful book it was! Her characters were real, believable, sent sparks of romance flying as well as emotional turmoil and decisions that had to be made. Esther Beachy and Viktor Petersheim are both running away from their personal situations. Esther is escaping an overcrowded house, a father who expects her to turn over all her earnings to her family and a marriage that is arranged to Henry Beiler who turns out to be emotionally and physically abusive to her even while courting. Esther is hired by Reuben and Anna Petersheim to be Anna's caretaker. Viktor escapes a family tragedy and the pain and unforgiveness he feels by working on a riverboat. Viktor comes home infrequently to take care of his responsibilities to his grandparents Anna and Reuben. I loved how the romance between Viktor and Esther developed and how Viktor showed her how to enjoy life. The Snow Globe was given to Anna as a gift by Esther for her birthday. There is so much more meaning to the snow globe when Esther sees that it also represents her life. A special song also plays that adds to the meaning. You will be cheering on Esther and Viktor throughout the book and I loved that the story showed that no one is beyond Gods forgiveness no matter what they have done. It was also sweet to see faith and family love in action. Esther Beachy enjoys working for Anna and Reuben Petersheim. But she is not looking forward to the return of their grandson, Viktor, in a few weeks. She wonders if he has changed since he's been gone. Viktor has been working on a riverboat on the Mississippi river for years, trying to forget the past. On his return to his grandparents farm he is surprised to find Esther...a grown-up Esther...staying there to care for his grandmother. Viktor and Esther are drawn to each other, but Esther already has a boyfriend—Henry Beiler. Who will she choose, Viktor or Henry? What path does God have for them to take? There is a lot more to the story, but I do not want to give anything away. I really enjoyed this book. I like the way Laura Hilton weaves a story with characters that capture your heart. I found myself rooting for Esther and Viktor to overcome the challenges they faced. Really did not like Henry much. If Esther chooses Henry she would have a very different life than if she chooses Viktor. Past tragedies impact Viktor's life and future decisions. Can he forgive himself for something he feels responsible for? Laura V. Hilton has woven another book that draws me in and makes me feel at home with these people. Esther is just trying to do what is right and what is expected of her. Is she happy, I think she thought so until Viktor arrives and shakes her world. We can tell Viktor is struggling with something that won't let him live the Amish lifestyle but at the same time won't let him leave it all behind. Anna and Reuben seem to be more on Esther's side than their grandson's side, but are they really? A Laura V. Hilton has woven another book that draws me in and makes me feel at home with these people. Esther is just trying to do what is right and what is expected of her. Is she happy, I think she thought so until Viktor arrives and shakes her world. We can tell Viktor is struggling with something that won't let him live the Amish lifestyle but at the same time won't let him leave it all behind. Anna and Reuben seem to be more on Esther's side than their grandson's side, but are they really? Are there sides to take in this matter. I fell in love with Esther as she tried to be the good daughter and do what her parents expected, just like any good Amish girl. I think Viktor would have been the popular guy in school that all the girls were warned about, but still wanted him to notice them. Henry strikes me as the spoiled rich kid who always gets his way one way or another. So even though I am not Amish, I was drawn into their story as I could see it happening in my neighborhood. I couldn't wait to get my hands on The Snow Globe and would advise you to grab a copy and visit Jamesport. Meet some new friends, visit some old friends, and fall in love with a new community. The Snow Globe is Book One in The Amish of Jamesport series and WOW! it starts off with a bang! Esther Beachy enjoys working for Anna & Reuben Petersheim as caretaker to Anna. Her situation at home is very strict and very crowded. She, however, dreads the day when Anna & Reuben's grandson, Viktor, comes home from his job on the river, which he took when he left the Amish on the day his parents and siblings were killed in a house fire. Viktor has always been an obnoxious flirt, and Esther The Snow Globe is Book One in The Amish of Jamesport series and WOW! it starts off with a bang! Esther Beachy enjoys working for Anna & Reuben Petersheim as caretaker to Anna. Her situation at home is very strict and very crowded. She, however, dreads the day when Anna & Reuben's grandson, Viktor, comes home from his job on the river, which he took when he left the Amish on the day his parents and siblings were killed in a house fire. Viktor has always been an obnoxious flirt, and Esther is determined not to be one of his conquests. So when he returns home to take over the farm, Esther keeps her distance. It doesn't take long for Esther and Viktor to realize their mutual attraction and their relationship is just as tumultuous as a shaken snow globe. Viktor has something in his past that keeps him uncertain about his future. Will he share that part of himself with Esther? Esther has been promised to another Amish man. Is she willing or will she be forced to keep that commitment? Forgiveness, God's love and answered prayers are sprinkled throughout the book. I love snow globes and Amish fiction, so I knew this book was a must-read! Great gift, too! Snow Globe by Laura V. Hilton is a very good book and Laura is very talented, but one thing I don’t care for in this book is the kissing, touching and thinking of the two who are in love. It would have been a 5-star plus book if not for that. Call me old fashioned, but I believe you can write an excellent book without thoughts, etc..
Esther knew Viktor when they went to school, but he never paid attention to her. He was always off with other girls and he had many. After a horrible tragedy Viktor left the Amish and took to the river and a boat. He comes back sometimes to check on his grandparents. Esther is working for his grandparents. I did enjoy Snow Globe and know you will also. I recommend this book by Laura V. Hilton. I received this through GoodReads first read's. The writing and the flow of the book was done very well and kept me interested throughout the book. The author did a very good job in keeping the story progress without giving away too much too soon or too late. This is a very sweet story. I loved the story behind Victor leaving before returning and he seemed to contain a lot of growth. Esther had some development, but not nearly as much as I hoped; that being said there really didn't seem to be much I received this through GoodReads first read's. This is a very sweet story. I loved the story behind Victor leaving before returning and he seemed to contain a lot of growth. Esther had some development, but not nearly as much as I hoped; that being said there really didn't seem to be much except that she was able to gain and keep her voice that she needed to preserve. What I enjoyed was it not only about romance, and being with the proper one you love and are meant to be with, but also being true to who you are, even in the face of hatred and evil. This is a very different Amish work of fiction and I love it! Laura V. Hilton has written a beautiful story of love, forgiveness. abuse, death, and mercy. Esther and Viktor are two of the most likable characters. I fell in love with them immediately and was rooting for them to fall in love and marry, but life has not that simple for the two young people. They have a long road to travel and Henry is already engaged to Esther and is not willing to give her up. Henry was a character that I quickly This is a very different Amish work of fiction and I love it! Laura V. Hilton has written a beautiful story of love, forgiveness. abuse, death, and mercy. Esther and Viktor are two of the most likable characters. I fell in love with them immediately and was rooting for them to fall in love and marry, but life has not that simple for the two young people. They have a long road to travel and Henry is already engaged to Esther and is not willing to give her up. Henry was a character that I quickly developed a distaste for. I expected a Christmas story based on the title, but it wasn't and I was pleasantly surprised by the way the story got its title as well. I rate this 5 stars and highly recommend it to readers. Delightful story of love through adversity. Esther must deal with her new attraction to Viktor and her uncertain future with Henry. When rumors are spread by Henry that calls into question Esther's commitment. I laughed and cried while reading this book. A story of having faith and trusting in God and love. I found my first book by Laura V. Hilton a beautifully romantic, angst-filled read. However, there were many short 2-3 word sentences that kept the story from flowing smoothly and gave it a choppy feeling. But in spite of that the storyline was intriguing and the conclusion satisfying. A wunderbaar love story that was very hard to put down! Esther's world is turned upside down with the return of Viktor. What should she do? Excellent reading!! A wonderful book - I felt the full gamut of emotions while reading it! I was in tears at times, laughing at others, worried, scared, and overjoyed at the ending. It doesn't get better than that! I really enjoy this author's writing style! Not a romance fan, but I tried this because it's set in one of my most familiar places on earth. Only problem is, it could've been set anywhere. There were no Jamesport landmarks at all, and...well, it's definitely a romance novel. A well-written beginning of "The Amish of Jamesport [Missouri]" series. The author, Laura V Hilton, creates a wonderful tension yet love between the two central characters. The side characters are also developed so that the reader will want to know more about them. The book has garnered many five stars so why am I only giving four. I added this book to my Amazon Wishlist in hopes I would receive it as a gift and I did. You see the Amish began to move into Jamesport when I was just a little girl. A well-written beginning of "The Amish of Jamesport [Missouri]" series. The author, Laura V Hilton, creates a wonderful tension yet love between the two central characters. The side characters are also developed so that the reader will want to know more about them. I added this book to my Amazon Wishlist in hopes I would receive it as a gift and I did. You see the Amish began to move into Jamesport when I was just a little girl. I do "get homesick" and was hoping to see glimpses of the area via the book. If that is your hope too--you won't. There is not one description, one word (other than the word "Jamesport") that tells you anything about the area. On top of that in the "Acknowledgments" (chapter), it states "The residents of Jamesport, Mississippi, and the surrounding areas..."
Mississippi???? But in the next paragraph, she thanks her husband for traveling there with her and "...being driven through Kansas City." Now Kansas City is about 100 miles or less from Jamesport, Missouri but a heck of a long way from Mississippi. The MS used in the "Acknowledgments" is a typo I'm sure. There is a trip that occurs by truck to an adjacent town. Why not mention the town? It had to be Trenton. Another town of Gallatin is in the opposite direction. Why not describe going by the old cabin that was built by a first settler and still stands. If one goes to the Amish fabric & food store, you drive right by it. And all Amish that live out thataway drive by it as well. The Amish also are often seen eating in two restaurants there. It's a wonderful little town. I was just disappointed not to read of the beauty of the countryside and the town of Jamesport. The Amish of Jamesport is Old Order Amish. If you visit there, please honor their religious belief that pictures of the face are not appropriate. They will turn their heads to avoid it. Ms. Hilton writes this story keeping the Old Order in mind. Oh my! What a book! I was on the edge of my seat the whole way through "Snow Globe". After a house fire that killed his parents and brothers that left him the only survivor other than his grandparents, Viktor Petersheim left his Amish community for the Mississippi River for five years; He is now willing to return home to his inherited house that his grandparents live-in to make amends with them. What he find is even more than he looking for in his heart. With her family's home small and very crow Oh my! What a book! I was on the edge of my seat the whole way through "Snow Globe". With her family's home small and very crowded, Esther Beachy enjoys working for elder Petersheims in their quiet home. Anna Petersheim has had a health issue that leaves her in a wheelchair now. Reuben Petersheim, Anna's husband, hired Esther to care for Anna and run their home with the agreement with Esther's father that he would look out for her and protect her. Esther is promised to another in an arrangement set between both families since they've been born. When Viktor walks through the door, it is a scene in book that just has to be read! Why? There is no words to describe the scene of what Viktor's reaction to Esther, her reaction of him, Viktor's discovery of his grandparents health issues, and Anna's and Reuben's love of having Esther in their home. Will Reuben be able to keep his word to Esther's father? Is Esther going to marry the other? Will Viktor and Esther fall in love with each other? When rumors start to fly through-out the community, will the Bishop listen to the truth? These answers and more can be answered by reading "Snow Globe". I look forward to reading the next books in the series. To read what Laura V. Hilton has in-store for the characters and for us, readers. Rereading Snow Globe was delightful just like the first time I read this compelling story by Laura V. Hilton. There's a fantastic storyline with an underlying message of God's grace, mercy, love, second chances and faith that never fails an individual. The Snow Globe was an enjoyable read with Esther caring for an elderly couple, Anna and Ruben. Esther is very compassionate and loves this couple. She has been dating Henry but there are some concerns about his true character. When Rereading Snow Globe was delightful just like the first time I read this compelling story by Laura V. Hilton. There's a fantastic storyline with an underlying message of God's grace, mercy, love, second chances and faith that never fails an individual. This is book one in The Amish of Jamesport series by Laura V. Hilton. I love loved it! Laura v. Hilton is a wonderful writer! im so happy that Esther went with her heart and trusted God! I was drawn into the story from the beginning. I love books like this. A person is nothing without God. He is what makes us whole in our daily lives. The Amish aren't perfect either. They gossip and spread rumors especially when there is another person involved. This book shows that the Amish are human beings too! Snow Globe is first in this series. I made the mistake of reading P I love loved it! Laura v. Hilton is a wonderful writer! im so happy that Esther went with her heart and trusted God! I was drawn into the story from the beginning. I love books like this. Snow Globe is first in this series. I made the mistake of reading Post Card first. This was a typical Amish romance story. Esther works taking care of a elderly woman and her grandson comes home, someone that Esther went to school with and she thought he was obnoxious. When he comes home they fall for each other but are kept apart by the rules of the Amish and the man she is supposed to marry. Her publishing credits include three books in the Amish of Seymour series from Whitaker House: Patchwork Dreams, A Harvest of Hearts (winner of the 2012 Clash of the Titles Award in two categ Award winning author, Laura Hilton, her husband, Steve, and their five children make their home in Arkansas. She is a pastor’s wife, a stay-at-home mom and home-schools. Laura is also a breast cancer survivor. She has self-published a Christmas novella, Christmas Mittens. Laura is a member of American Christian Fiction Writers and a professional book reviewer and blogs for Putting on the New and Seriously Write.